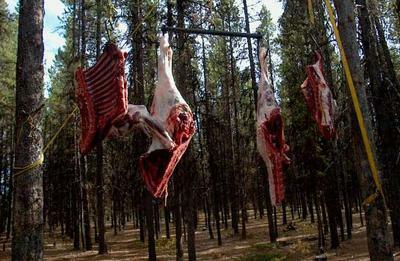 Proper Way of Cooling Moose Meat - Don't Delay Your Skinning! 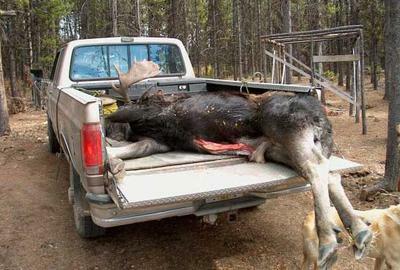 If a hunter shoots a moose on Friday and (the weather is 32F)and loads it onto his truck and hauls it home to his garage. He then waits 5 days to skin and quarter it (the weather is now above 32F), will the meat be any good? Did the moose stay in the truck in the garage? When you say the temp is above 32F, by how much? Once skinning commences the person who is skinning will find out very soon if the meat has gone sour. Follow your nose, if it stinks it's no good. Green, even worse! I would be a real shame for this person to loose an entire moose carcass. If bone sour is suspected, follow your nose and cut out the bad parts. There could be some salvage there! Any animal that is killed needs to be cooled as quickly as possible. Five days is too long to wait! Hopefully this person doesn't loose the entire animal... such a waste! What is wrong with some people.. ??? Any case... They shot THREE MOOSE AND NO MEAT? WHERE were the OUTFITTERS .... ???? The group had three nice sets of horns skinned out heads / European-style! LAST SEASON, we ran into and had chats with three small hunting groups; none of these groups had a guide with them but they said that they had been dropped off and would be picked up in a couple of days. Two of these groups had horns BUT NO MEAT...just caped out head... STRANGE? As we scouted the area... We found THREE DEAD MOOSE: Two were caped out with no heads, one still had the head on. Illegal bull kill, I guess! There is no excuses why this needs to happen. Advice on whether to skin or not to skin... Skin the animal!!! Split it in half or quarters... Even @. 32 degrees... You want to bring the CORE TEMP down. If the out side stays tacky.... You have ONLY hours before that meat will spoil. Put your hand on the carcass...is it cool or warm? Flies are a good indication it is too warm and you beat get the meat to a cooler. I would never wait 5 days with an animal that is not frozen. We take caribou north of the arctic cirdle and temperature is usually -30 to - 40. Caribou being small freeze quickly. So we bring home and thaw out and skin asap. But to leave an moose with hide on and not frozen I do not think will be too good. Once the meat cools the skinning process is much harder to complete as well..